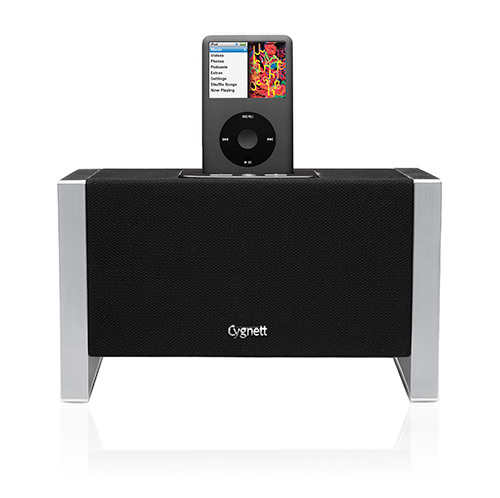 As we continue to check out some of Cygnett's clever and affordably priced accessories for the iPhone and iPod market, the Maestro Portable Speaker System for iPhone & iPod was the next item we were looking forward to review. Boasting crystal clear sound, decent bass, charging capbilities and a remote control, this is everything you need to get your party started. Best of all, this small and chic looking speaker system definitely hits the market hard due to its affordable price at under $200AUD that definitely becomes a contender in this already over saturated market. Even better, the Maestro supports a plethora of other iPod devices, including third party MP3 players but of course, the speakers were designed for the world's greatest smart phone, Apple's iPhone. The first thing you will notice about the Maestro is the size which is quite small but it does not skimp on quality whatsoever. This is due to the fact that it has a dedicated subwoofer at the bottom and two mid range speakers which produces some rather impressive audio that what was quite clear and crisp. In relation to design, the top part of the device allows you to plug in your iPhone or related iPod device, two buttons for volume and a button to power for the device. 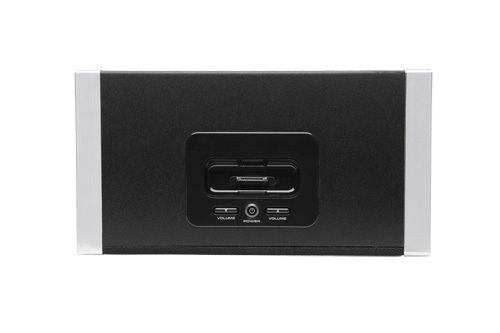 On the back of the unit, there is a battery/power input switch, auxiliary input for other music devices, power-in and finally on the reserve side, the ability to add batteries. Although you would probably not purchase this device if you did not have an Apple iPhone or iPod and as mentioned, there is an auxiliary input which allows you to connect other third party MP3 players like iRiver or the Creative Zen MP3. Very simple, just plug it in with the cable supplied and off you go. Unfortunately with other MP3 players, the functionality of the remote is lost. We tested the device on both the iPhone and iTouch and even when the system was turned up to the maximum volume, there were only a few distortions and this was mainly due to the music that we were listening to. For this price range, the Maestro is definitely a contender to its competitors and we were thoroughly pleased with the quality. The unit even comes with a tiny remote control that allows you to perform a variety of features such as navigate, shuffle and even power off to name a few of the features. It should also be noted that the remote comes with a battery as well. Although the iPhone is a "phone" but most people use the device for a plethora of others options, another nifty feature of the Maestro is the ability to fade the music when your phone starts ringing which definitely alerts you that someone is attempting to call you. Funny enough, it actually made me think twice as to what was going on as I was not ready to test this feature yet but needless to say, it worked perfectly. One last feature is the battery backup option that allows you to take the device anywhere and according to Cygnett with AA Alkaline batteries, the unit will last around 4 - 5 hours which is quite an impressive feat. At the end of the day the Maestro Portable Speaker System for iPhone & iPod is a very well made piece of hardware that is perfect for your iPhone, iTouch or iPod that will satisfy even the most prudent of music connoisseurs. A good and neutral design, decent audio and some great bass, this is one item that you should definitely investigate if you're in the market.